This is a traditional Christmas treat at our house. We gave it away to our neighbors this year too. This recipe makes 20 servings. 2. 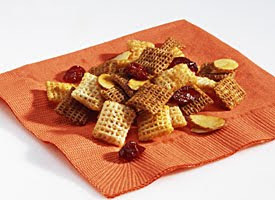 Combine chex & almonds in a large roasting pan. 3. In a microwaveable bowl, combine butter, sugar & OJ. Microwave for 30 seconds. 4. Pour over cereal & nuts. Mix well & cook uncovered for 30 minutes, stirring after 15 minutes. 5. Stir in cranberries & let cool.